HardVery muddy. Steep. Rock scrambling. Slippery tree roots. 3/5Lots of mud. Hard long track. But beautiful forest, and possibly good views (maybe?). We were wet, cold, and overly miserable after 3 hours of walking in knee-deep mud under light rain. Arriving at the summit of The Cone, we were in thick clouds. 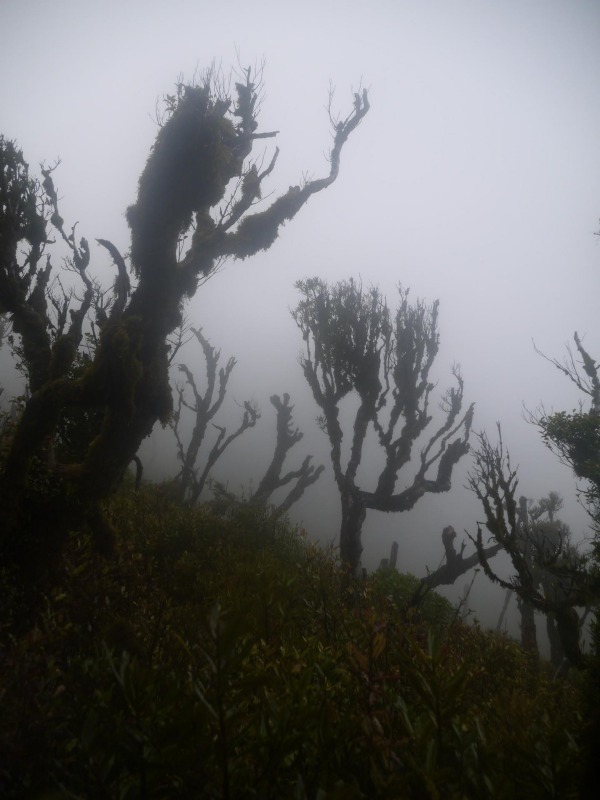 The supposedly magnificent views you should get from the 953 meters summit were nowhere to be seen, and we still had more than one hour of walking to get to the hut, continuously going up and down on the ridge, trying to avoid the deeper mud pools. But this is when, jumping from side to side, climbing steep wet roots, with no views, feeling the beginning of a blister on my left foot, laughing at those ridiculous short boardwalks located in the middle of large mud pools, that I realised, surprised, that I was actually enjoying myself. That the wet bush was magnificent in itself. No need for any views, or sun, or warmth, or being dry when you could just contemplate some of the best moss of the North Island, growing on old, ghostly and scary trees. So, are you up to the challenge? Do you like mud? Do you like extensive amazing views (if you are lucky)? 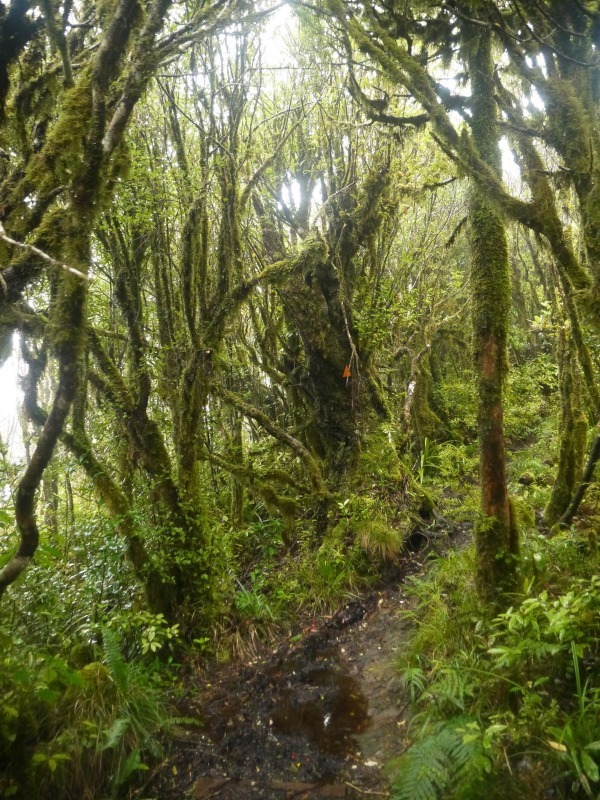 Then hop on for this challenging two days loop, less than 2 hours drive from Auckland, taking the Bell track (8-10 hrs, 17.5 km) to climb to the Pahautea hut, going back down the next day along the Tahuanui track (4-5 hrs, 10.5 km). Public transport: poor to none, you can take the train to Hamilton, then an infrequent bus to Whatawhata, but you would still be 20 km from the start of the walk. 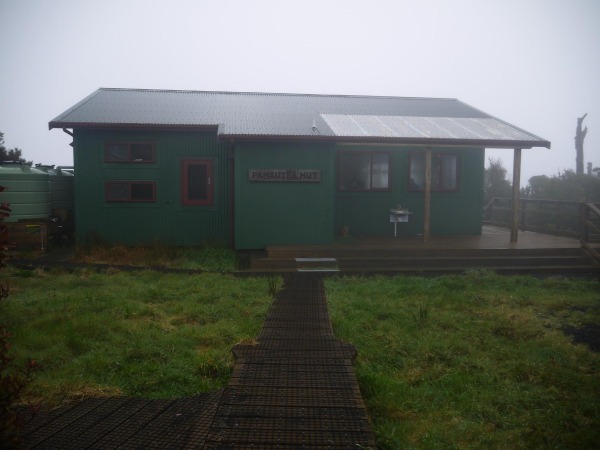 The Pahautea hut is a nice, large, modern, 20 beds hut ($5 per person, one hut ticket, or Backcountry Hut Pass). The old hut with 6 beds is still available beside it, so that makes it a 26 beds accommodation. Be warned that it is often full in weekends, as it is a popular destination, especially for people who choose to come here via one of the shorter 3 to 4 hours tracks. So you should carry a tent, or at least a mattress so that you can sleep on the floor in the hut. There’s a number of nice, gravel campsites, to keep your tent out of the mud, and even a shelter with tables and benches to stay dry. The hut has water (should be OK to drink, boil or treat if unsure), toilets, tables, but no stove or cooking facility. There’s also a cleaning station to clean your muddy shoes, and believe me that’s really useful. The hut can be quite cold, even in summer. If you haven’t been scared by my earlier description, it probably means you think it couldn’t be that bad. And it might not be that bad, in summer, after months without rain. Maybe. But I doubt that this track ever dries completely. And this mountain is often lost in mist and rain. So be warned, carry warm, dry clothes in a waterproof bag in your pack for the night, or you might get really cold. 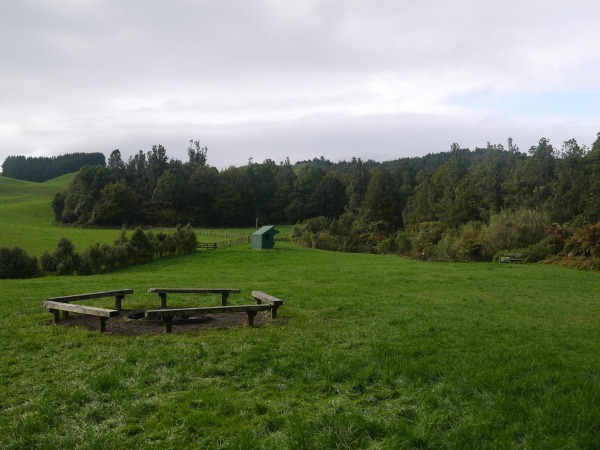 If you are doing a week-end trip from Auckland or if you have a bit more time you can slightly shorten the first day by walking 45 minutes (2.5 km, easy, flat) to Kaniwhaniwha campsite (free, toilets, two picnic tables, rubbish bins, water from the river should be filtered or boiled). It is very (very) large so you are almost guaranteed to find a free site to pitch your tent. This will just shorten the first day slightly, but it’s still better than nothing. And if you drive from Auckland on a Friday night this is a good spot to camp and be ready for the next day. On the first day I suggest you don’t leave later than 8 am, as this is a fairly long day, from 8 to 10 hours of walking. We walked as fast as we could and we still only made it to the hut in about 8 hours. But it was raining for half of the day and the track was fairly wet underfoot. 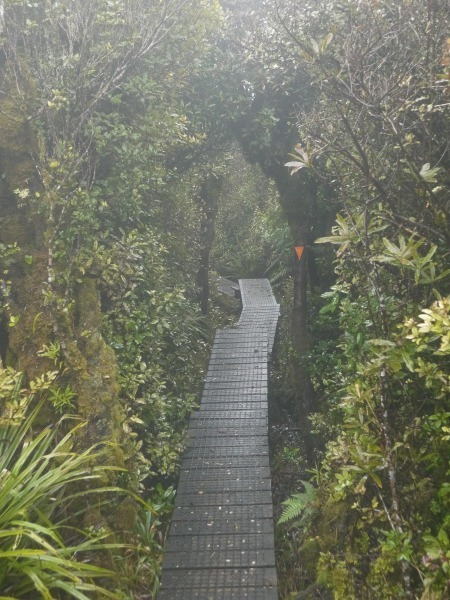 From the Kaniwhaniwha Reserve car park you cross the road and use a short boardwalk to join a vehicle track along the river, up to the Kaniwhaniwha campsite (with toilets). Cross the campsite and follow the gravel track slightly down and to the right, along the river to a nice wooden bridge. The Bell Track is clearly signposted and marked with orange arrows. 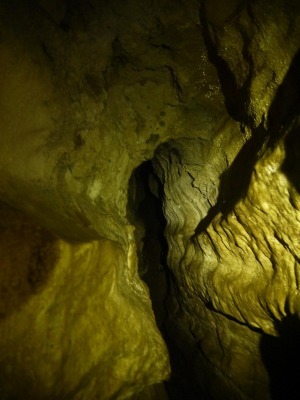 When arriving at the Kaniwhaniwha cave take the time to visit it, it’s just a short walk. Not the largest cave in NZ, or the nicest, but still an interesting thing to see on the way. From there you follow the river for about one hour, the track is slightly muddy, with some short ups and downs, and then you reach a suspension bridge and a junction with the tallest native tree of New Zealand, a kahikatea. In case you are wondering, the actual tallest tree of the country is in Otago (South Island) and is an Australian mountain ash gum tree. 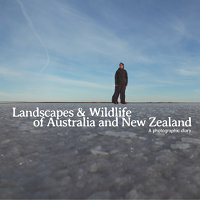 And the largest is a kauri in Northland. You can drop your packs at the bridge and walk 5 minutes to see this giant, an escapee from the time where the forests were only valued for their timber and when almost all of the trees, usually hundreds or thousands of years old, have been cut to make boxes, boats or houses, that are now mostly gone, destroyed or decayed. Those trees would still be standing by today if not for the greed of the early pioneers. Backtrack to the bridge, cross it and follow the track uphill, under a thick bush cover. One hour and fifteen minutes later you should reach the central clearing campsite, with a couple of benches and a few mostly but not completely flat tent sites, and a sign stating that you are roughly at the middle of the day. This didn’t prove true for us, as we had walked three hours from Kaniwhaniwha campsite, and we took 4.5 hours more to reach the hut. But you can congratulate yourself by saying that you did 9.5 km of the 17.5 Bell track from the car park. Only 8 km left! But this is where stuff begins to get serious. From the campsite you will have to climb 500 metres of altitude to reach The Cone, the second highest summit of Pirongia, but because the ridge is far from flat (well, that’s a ridge) you will actually have to climb up to 700 metres and descend 250 metres to reach the hut. The climb is not too rough for the next hour and a half, but then when you reach the beginning of the ridge after two hours, it starts to get steep, with some parts needing some climbing using tree roots, and some rock scrambling. This is not too hard unless it is wet and slippery, but it is steep and tiring. And if it has rained recently you will have to cross a lot of mud-pools, and some might be quite deep. But at this point your feet and shoes will probably be completely soaked and you will just walk in the middle of the mud instead of trying to avoid it. Be careful still, as some tree roots are rocks might be hidden in the mud. You will reach a first summit after two hours and a half from the campsite (point 768 m. on the topo map), but unfortunately the track is soon losing 40 metres of elevation, before the final steep climb to the actual summit, only interrupted by a first “fake” summit at 918 metres. You reach the real summit and its helipad about one hour after the 768 metres point. If you are lucky you might get extensive views down to the ocean. If not you will pass quickly in the mist in your haste to get to the hut. From the summit there is more ups and downs, and more mud, sometimes interrupted by short boardwalks that seem like a joke (or an insult) when you just had to wade through knee-deep mud for 50 metres just to reach the 10 metres long boardwalk. About 10 minutes from the hut you will reach a long boardwalk, giving you about 500 metres of nice easy walking to finally reach the hut. The second day is shorter and the track is slightly better than the Bell track, meaning mud is not as bad or as long, but still present. This is part of the Te Araroa long distance trail that runs for 3,000 km from the North end of the North Island to the South end of the South Island. From the hut follow the Tirohanga Track and after 25-30 minutes of nice walking between the mossy low trees you will reach Pirongia Summit, with a lookout platform, giving you wonderful views (or not). 10-15 minutes later ignore the next intersection with the Mahaukura track, keep left on the Tirohanga Track. About ten minutes later on you reach the intersection between Tirohanga track and Tahuanui track. Take left on Tahuanui track. The DOC sign says about 4 hrs 30 minutes back to the carpark from this point, and you can do probably do it quicker. But the start will be slow for everyone as you have to descend on a narrow track in low scrub for 10 minutes before reaching a goblin forest, moss covering mostly dead trees making weird and scary postures. This is one of the most beautiful parts of the walk. From the goblin forest the mud becomes worse, until you drop below 700 metres (after 1 hr 30 minutes) and reach the taller trees, when the ground drainage is better and the mud bearable. From that point your speed will get better and the next 8 kilometers (downhill) should only take about two to three hours, with easy walking, except a muddy and slippery part not long before you reach the Kaniwhaniwha campsite again, finally. There is only 45 minutes of walking and 2.5 kilometres of easy flat walking left to the car park.